On May 17 at 7:00 PM, the Ride of Silence will begin in North America and roll across the globe. Cyclists will take to the roads in a silent procession to honor cyclists who have been killed or injured while cycling on public roadways. Although cyclists have a legal right to share the road with motorists, the motoring public often isn’t aware of these rights, and sometimes not aware of the cyclists themselves. In 2003, Chris Phelan organized the first Ride Of Silence in Dallas after endurance cyclist Larry Schwartz was hit by the mirror of a passing bus and was killed. 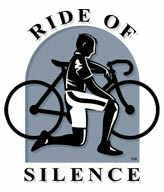 The Ride Of Silence is a free ride that asks its cyclists to ride no faster than 12 mph and remain silent during the ride. There is no brochure, no sponsors, no registration fees and no t-shirt. The ride, which is being held during Bike Safety month, aims to raise the awareness of motorists, police and city officials that cyclists have a legal right to the public roadways. The ride is also a chance to show respect for those who have been killed or injured. This is very depressing. My average commute speed is about 12 mph. Therefore I’m now officially slow. I’m actually grateful for the pace. Moe and I will be attending the on in Fullerton Ca. Any faster I’d be in trouble!